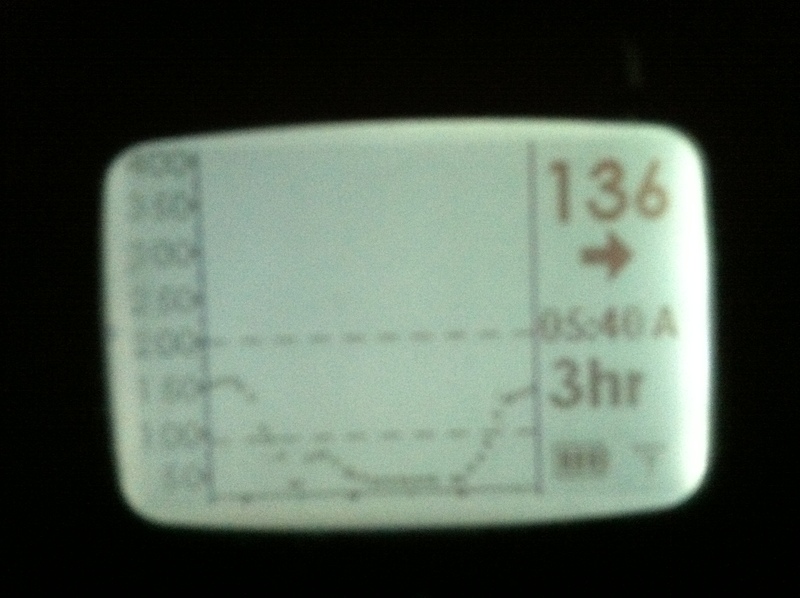 One of those lows that wakes you out of your deep sleep with the demanding wail of your Dexcom (CGM – continuous glucose meter). It violently alarms on the bed between you and your husband. When you look at the screen, you are too low for it to register. You request for your husband to turn on the light so you can do a test. This low feels a lot worse than that though. You know the ones that you wonder how you will survive the next minute because you feel so bad. Your whole body is shrieking out in discomfort. And it lets you know loud and clear it is not happy with you in its current state. I am still recovering as I type this post. Do you ever notice with lows like this that your mouth tastes funny? Do you get that taste in your mouth too? This must be the scent dogs can pick up. As I lie here recovering, I had a flashback. I remember throughout high school the binge I would have when I was low. I’d get myself to the kitchen then park at the kitchen table with a glass of OJ, a bag of cold chocolate chips (must be stored in fridge for full chocolate sensation & maximum deliciousness – ever tried it?? Soooooo yummy and good) and a box of Golden Grahams. Something about this taste in my mouth that only comes about with bad lows caused me to vividly remember the enjoyment I would feel as I munched on that chocolate and cereal. If it wasn’t for the food allergies I have (recognized since that time) I would be driving to the store tomorrow to buy some. I miss Golden Grahams!! I wonder if I’d still like them as much. You know this kind of low. Where the standard 4oz. of juice just does not feel adequate to treat. Foolishly I called out to my husband in the kitchen for more than the usual 4 oz. when I saw that I had .32 insulin units on board on my pump. I told him to bring me 6 oz. This low called for more. I hobbled to the kitchen with all the might in my body after being given the juice. There were only a few left in the bag so I grabbed some dark chocolate too. Dagoba dark chocolate drops. A handful. Hmmm. And the box of gluten free animal crackers. I headed back to the bedroom and ate in bed which created a mess and a bed full of crumbs. I made myself stop eating before I was truly ready for fear of the evil rebound. Will I get too high? I hope not. Right now after bolusing 2 whole units in the time I’ve typed this I’m at 132 – diagonal arrow up. I started writing this post to hear about your experience. I truly want to know how many of you experience those lows that feel like this (really, really extreme) and how often your lows feel like this. Do you feel this every time? I do not get these really terrible feeling lows very often. Maybe once a year. I think when I was younger, I experienced them more often. Note: I did wake up in the 200’s and I had to bolus a few more times. Oh well. We all need the opportunity once in a while to treat these miserable feeling lows with tasty treats. I can hear the health advocates disliking this post right now. I am not advocating over-treating low blood sugars with too many carbs as something that is healthy to do regularly or at all. I am just sharing my experience with you as I am human and do not always make the smartest choices — especially amidst a low. What do you usually use to treat your lows? Do you ever grab every yummy treat in sight and eat until you feel better?? I think my iPhone was feeling the low too! This was post-food intake waiting for rebound. Ohh, I’m sorry you had such a crumby low!!! I try to treat my lows with things that I don’t actually enjoy eating, that way I don’t think of them as food, but purely as medicine, and I’m not tempted to over-treat my low! Thank you Ginger. : ) Crumby low? Get it – as in animal cracker crumbs in bed. Lol. Fortunately I do not get these severe lows very often which makes it easier to stick with my 4 oz. of OJ. Your system sounds pretty smart. Thanks for the comment!